I’m going to give you tips and tricks I have picked up in my three years of blogging (remember, I didn’t start out with a doll blog, I had a different one for a couple of years). Hopefully, I can give you the know-how and inspiration to hop online and create your own AG doll blog. Step 1) Get your parents’ permission. This is one of the most crucial steps in starting a blog of any kind. If you don’t have your parents’ permission, but start a blog anyway, don’t think they won’t find out. (Trust me, they will.) Creating a blog without permission will get you grounded, and your parents won’t trust you to ever have a blog, even in the future. So ask politely. If your parents say no, politely ask why. Don’t whine or beg. Are they worried you’ll run into cyberbullies or creepy guys on the Internet? Tell them that you can create a private or password-protcted blog. Are they concerned that you will spend all your time blogging? Ask them to help you set up a schedule. If they need time to think about it, give them time (without interrupting). If they still won’t agree, leave it be and ask again in a few months. Step 2) If you got a “yes” from your parents, it’s time to pick out your blogging platform. I have only ever used WordPress, so that will of course be my recommendation. However, there are other sites such as Blogger, Weebly, TypePad . . . the list goes on and on. Step 3) Look through and decide which plan you will use. A “plan” is basically the type of service you will get through your blogging platform. I’m not sure how it works with other platforms, but WordPress has several plans to choose from – the free plan gets you several different blog designs to pick from, a few gigabytes of storage space, etc. More expensive plans will get your more (or even unlimited storage), and hundreds more designs. Before paying for an expensive plan, ask your parents if it is okay first. You don’t need an expensive plan to blog – I have been using WordPress’ free plan for three years, and it works great. Step 4) Pick your blog’s theme. Look through your platforms’ blog theme choices and pick the one that you think best suits your blog. Remember, you can always change your theme in the future, so don’t think you will be stuck with your chosen one forever. However, don’t change yours every week, it may annoy your followers. Step 6) Now that you have set up your blog, start posting. This is harder than it sounds – but it is also a lot of fun. Get inspiration from other peoples’ blogs (however, do not copy posts/blog designs.) The great thing about AG blogging is that there are so many different types of posts you can do! Photostories, photoshoots, photoseries, craft/hair tutorials, create/participate in tags/awards, etc. You can also create something that is unique to your blog. I created The Dog Blog a few months ago, and I haven’t seen it anywhere else yet. Step 7) Make friends while blogging. I have become really good friends with my followers – some of us even email and write letters to each other. I have mentioned this before, but friends was not something that even crossed my mind when I set up American Girls in Alaska. My previous blog was password protected, so the only people who read it were people I already knew. Start chatting in the comments on other people’s blog. You can ask someone to check out your blog, but don’t add a follow-up comment saying something like, “did you check out my blog yet?” That can be annoying. If you want to subtly invite someone to your blog, sign your comment with your name/username and underneath, add your blog’s URL. I have followed many people who have given me their URL and didn’t even ask me to check out their blog. Step 8) Be courteous, kind and respectful. No one likes a blogger who is rude, swears, etc. You catch a lot more followers with honey than with vinegar, that’s for sure. Did you enjoy the post? Would you like to see more blogging tutorials in the future? Do you have any tips to share? Did I completely forget something? Comment below, I would love to chat! Day #10???? Say what now????? Yep! It’s Day #10 of TDOC here on American Girls in Alaska. Today I will be doing my first ever hair tutorial! I will be showing you two cute holiday hairstyles, as modeled by Grace and Emily! Step 1: Braid your doll’s hair. Step 3: Tuck the elastic part under the braid. Step 4: Bobby pin the braid so that it stucks to the doll’s head. Step 1: Seperate a small section of hair from the doll’s head. Step 2: Seperate that section in two. Step 3: Cross the left section over the right section. Step 4: This is a bit hard to explain, but you’re going to take hair from the rest of the doll’s head and add it to the the section on the left (the one that is hanging down). Step 6: Continue to grab hair and add it to the section hanging down before twisting that section over. If you know how to French braid, this should be very simple. I hope you enjoyed this tutorial. If you try these styles, send pictures to americangirlsak@gmail.com! Countdown to Christmas: Two days! Hi, everyone! It’s Grace here! Today, we’re going to be making some delicious Christmas cookies! Bonus: this recipe can actually be followed and used to make real-life cookies! However, American Girls in Alaska is not responsible for any injury, damage, or death that will not occur while making these cookies, but she has to say that just in case anyone does anything stupid. The supplies you will need for this recipe are: 2 1/4 cup all-purpose flour, 1 teaspoon baking soda, 1/2 teaspoon salt, 1 cup (2 sticks) butter, 3/4 cup granulated sugar, 3/4 cup brown sugar, firmly packed, 1 teaspoon vanilla extract, 2 eggs, and sprinkes. But before you mix anything, preheat the over to 375° degrees Fahrenheit. Step 1: In a medium-sized bowl, combine the flour, salt, and baking soda. Mix well and set aside. Step 2: In a large bowl, using a hand-held mixer or a firm wooden spoon, mix the butter until it’s creamy and lighter in color. Step 3: Mix in the brown and white sugars. Step 4: Add the vanilla and eggs. Sorry the eggs weren’t showing in the ingredients picture! Step 5: Gradually add the flour mixture to the wet mixture. Step 6: Make little cookie balls that are the size of the rounded part of the spoon. Step 7: This is my favorite part! Flatten the cookies slightly and shake holiday sprinkles on top. Step 8: Place them onto ungreased baking sheets and bake them for 8-12 minutes! This is how the cookies turned out! Sorry some of these images are weird, the camera wasn’t focusing right. It was going in and out and in and out really fast. Anyway, a bonus picture to show you the giant mess these made! AGs in Alaska had to wipe her hands on tissue paper for wrapping presents before taking pictures. Alright, see y’all tomorrow! Au revoir! Countdown to Christmas: Eight days! Hi, everybody! Oh my gosh, Christmas is in TWO WEEKS!!!!! Eek! Who’s excited???? Okay, if you haven’t already noticed, I redid my blog in honor of the Christmas season. It literally only took me three minutes, but I couldn’t figure out what to post today, so this is what you get. First, I went to my WordPress dashboard and clicked Customize. Don’t click Themes, which is right next to it, or it will just take you to your different theme options. Next, go to Colors and Backgrounds. I clicked on Palettes for my green color, but instead of having white on the side of my blog, I went to Manual and chose the red color that they had displayed. Then I clicked on “Pick Your Own Color” and changed the dark red they had to a brighter shade of red. I then slected the little photo button up at the top to choose my header image. I found a picture of Molly with a present and cropped that to fit. Guys, if you have the same theme as me, you probably understand how hard it is to find a picture that will look nice in that tiny little space AND not make the words unreadable, especially since you can’t change the font color. Unless you can and I haven’t figured it out yet. Lastly, I clicked “Publish” and went back to my dashboard. Then, I clicked Settings. In General, there will be a button that will make it snow. You change that to ON and then your blog will have snow! It’s really super easy, I was expecting it to be a lot harder to do that. But nope! I hope this tutorial helped in case you were wondering how to do any of these things, which you probably weren’t, but if you wanted to make it snow and couldn’t figure out how, then maybe this helped you! Alright, that’s all for now! CHRISTMAS POSTS START ON THURSDAY!!!! Aloha, my friends. 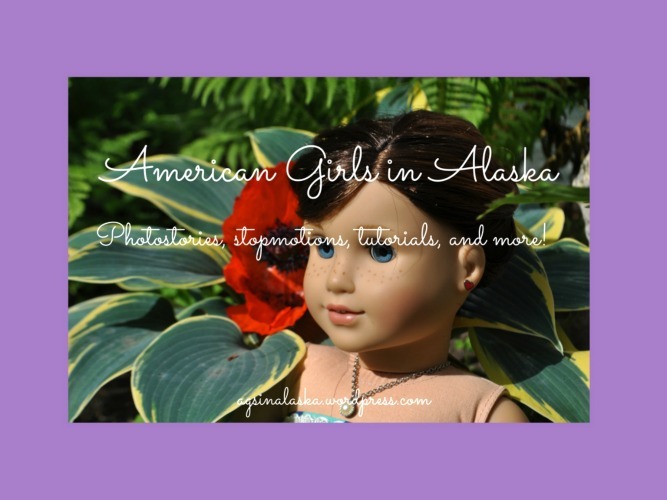 It is time for American Girls in Alaska’s first-ever craft tutorial!!! This tutorial is, as you may have guessed from the title, how to make a headband for your doll. This is a super easy tutorial, all it requires is that you know how to operate a sewing machine or know how to hand-sew. It took me under ten minutes to make the headband, so you can see how easy it is. Without further ado, to the tutorial! Step 1: Choose your fabric. I have this pretty purple fabric that is 32 inches by 2 inches. Step 2: Fold one side of the fabric to the middle and pin it. This is Side A. Step 4: Fold Side A over Side B and pin, if necessary. Step 5: Using a straight stitch, sew the fabric as close to the edge as you can. Sew all the way down the folded fabric. Step 6: Fold the end over 1-2 inches and sew across. Step 7: Repeat on opposite end. You now have an adorable headband! These photos are very blurry, I took them post-fixing the camera. I hope you enjoyed the tutorial! Send pictures to americangirlsak@gmail.com if you do this tutorial! Stopmotions movies are more popular than ever on YouTube. Those who make stopmotions with their AG dolls have even started to call it “AGTube.” So what exactly is a stopmotion? A stopmotion movie consists of a bunch of pictures put together and sped up very quickly. Sound confusing? Here’s an example: say I was taking a picture of Emily. Then I moved her arm just a fraction of an inch and took another picture. I move it again, just a teesny-weensy bit, and snap another one. Say I do that with twenty pictures. Then I upload them onto a movie-editing program on the computer (I use iMovie), and change the duration of each photo to .1 seconds. Then I play the video. Emily looks like she’s waving! So now you’re curious. You want to make one yourself. Well, you’ve come to the right place. Presenting . . . . American Girls in Alaska’s Stopmotion Tutorial!!!!! Step 2: Set up your set. Taking the time to do this right is crucial in producing a good movie. Make sure you don’t have human-sized objects like beds or tables in the pictures as they will take away from the doll-sized effect of your movie. However, some human-sized objects will work. I have a little caddy that goes on my desk for office supplies, but it works perfectly as a nightstand for Lindsey and Molly’s room. Step 3: Write the script. You cannot do a stopmotion without a script. It is your guideline to everything – even knowing how many pictures to take! After you’ve written the script, you can start filming. You can estimate how many pictures you need based off of it. For example, I have a line where Molly is saying, “I like your new shirt.” That took me about one second to say, so I’ll need about ten pictures. Then I’ll have enough time to say, “I like your new shirt,” when I record the audio. It’s better to have too many pictures than not enough – you can always take pictures out when we get to editing. Your second-picture ratio should be ten pictures for each second of audio. Lindsey: I’m so excited for summer camp, aren’t you? Molly: I came here last year, and camp was so much fun. Lindsey is starting out, so I need the camera trained on her first. Her line took me two seconds to say out loud, so I’ll need twenty pictures. Morgan’s took me only half a second, so I’ll need six or seven. Lastly, Molly’s took me another two seconds, so I’ll need another twenty pictures. It may seem like a lot once you’re done, but it goes by pretty fast. Now, how do I tell which doll is actually talking if there are more than one? Well, you can move the arms of only that one up and done. You can move their head from side to side. It may sound funny, but it works. In fact, those are the two main things people use in stopmotions for the “motion” part. Step 5: Upload. Upload your pictures onto your computer and get them into your program editing software. (This is why it’s best to take a class about your software first.) Once they’re in, change the duration to .1 seconds. Step 6: Add your audio. This is where you’ll add voices to the pictures! You can use the voiceover system on your software or use a microphone. I have absolutely no idea how those work, so I just use the iMovie voiceover. While it’s not super fabulous quality, it gets the job done. Add the audio line by line so you can speed it up/slow it down if it doesn’t match the pictures without getting overwhelmed. It’s really important to know how your software works. Step 7: Finalize your edits. This is where you add sound effects, music, or just watch the video all the way through and take out any errors. Or, you can go onto YouTube and search “American Girl Stopmotions,” “AG Stopmotions,” or just “AGSM.” Lots of channels abbreviate it as “AGSM” now. There are thousands of them on YouTube. Thanks for reading, and go make a stopmotion!